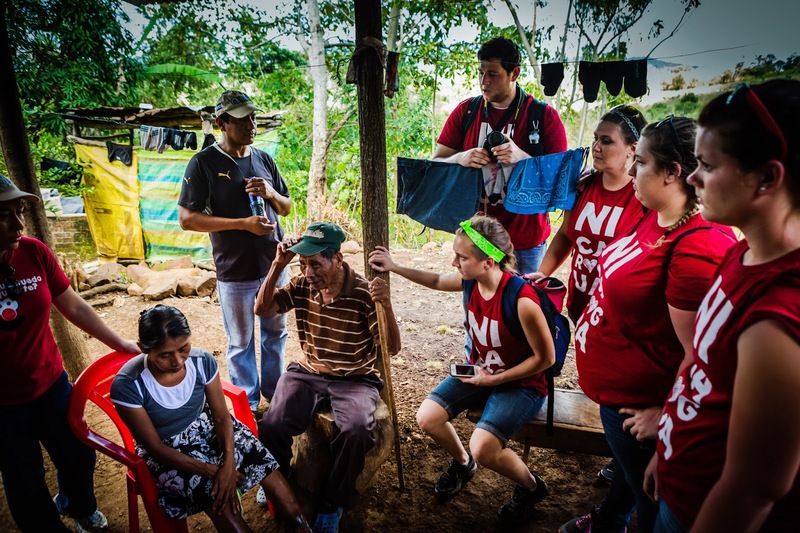 Getting to Nicaragua this time around has been anything but easy. It has seemed that around every corner there has been another obstacle or hurdle for our team to try to get past. But: God’s plans are so far above our own, and when you are in the will of God, the odds aren’t a factor. Despite changing team members, shortages of funds, and impending deadlines, we will be going to Nicaragua. Today we get on a plane and fly thousands of miles to another country with one goal. That goal is to show people the love of Jesus. When the hurting, oppressed, broken, and orphaned are met with the love of Christ, lives are changed. We are so thankful for each and every person who helped on our mission. Your dedication through financial support and through prayer has meant more to us than you can ever know. As we take off, please continue to pray for our team. Pray for safety and for good health, but even more than that, pray for an impact. Pray that lives are changed through our ministry and through the love that we pour out over the next ten days. We have made it. Satan tried to stop us, but we did make it. The hike up the mountain was the best part of the day. We got to hike up to a village and give food to those living up there. Many of them had physical ailments and terrible living conditions and extreme poverty. As we delivered food, we felt helpless. We Wish we could do more, and the verse that came to mind was, "...when I was hungry you gave me something to eat." We can't do everything, but at least we're trying our best with what is placed on our hands. 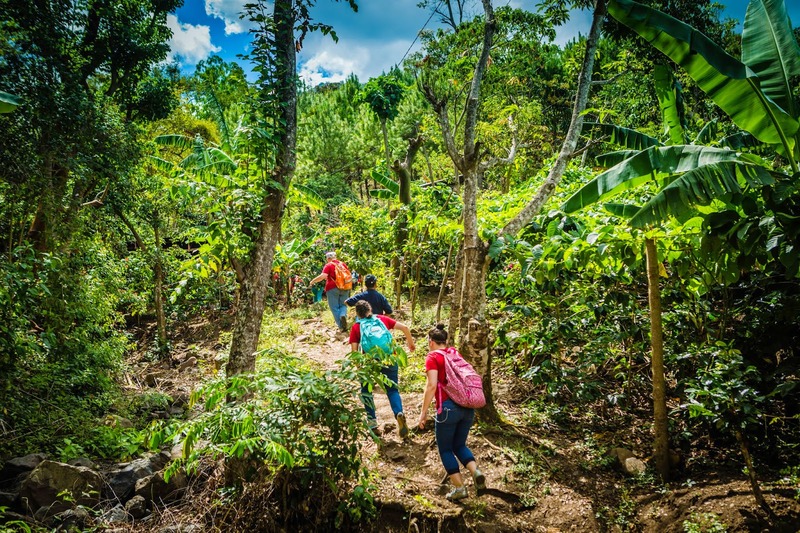 As we hiked between homes in the mountain, we thought of a line from one of Robert Frost's poems, "...the road less traveled..." Humbling oneself to meet the needs of people they don't even know is the road less traveled, and God is pleased with those who take that road. Part of the team had to split and go down the other side of the mountain to feed some additional families. We were told that it would be an easy hike to the other side but it turned out that although it was downhill, it was much harder than the climb up the mountain. It was tough and exhausting and some of us just wanted to stop and rest and not get up. It was a climb through thick bushes and ravines that made it almost impossible to reach the families in need, but we finally made it. Once we got there, one encounter made the whole hike worth it. At one of the houses, there was an elderly woman who we stopped to pray for and provide her with food. As we were getting ready to leave, she began to speak safety, health and blessings over us so that she could see us again next year. This touched us because it was a reminder that (1) we are not just here to speak into the lives of children and the elderly, and (2) we are nt here to see what we can get out this trip for ourselves. It was a clear reminder that we are here to bring Christ's love and joy to every person we encounter. * As told by Kelsey Morriston, Kimberly Naicker and Bethanne Milton. Mule. When I think of this animal, I usually compare it to a young strong man. But not today. Today was one of those days that we had scheduled to hike up a mountain and bring food to people that lived in various houses up the mountain. I encountered an old lady that hikes this mountain once a week to get to her church service. Here I am, a 21 year-old young healthy man, struggling to make it up the mountain. This old lady hiked it like if it was a walk in the park. Well, not really, it was an extremly hard hike. Between the exhausiting heat from the sun and the steep climb, I knew that she struggled up and down the mountain. What really caught my attention was her dedication to her church and to God. No matter how hard the hike was that she had to make every week, she did it despite the harsh circumstances of the path to get there. The things that these people do to get to church is amazing. Keep in mind that they are all primarily old men and women in their 80s and 90s. I compare this to life in the U.S. where we sometimes complain about getting up in the morning to go to church or we are just too lazy to drive to church. This goes to show you which country really needs God more. While we were waiting outside of a food distribution center, ready to pass out food to children and their parents, I was taking that time to gather my thoughts on how the service had gone earlier in the afternoon. At that moment I looked down at my feet and at first I noticed the dirt on my shoes and jeans, and I was thinking about the beads of sweat that were forming on my forehead. Then something shifted my focus. I noticed shards of glass laying in the dirt. Then I noticed a nail mixed in with the dirt. In fact, I noticed the glass and nails quite often in the dirt where these children played all the time. This made me think of all the comforts I have back in the U.S. I don't have to worry about about stepping on shards of glass or nails with my bare feet. Those little pieces of trash shifted my focus from how things were affecting me to how life has affected the people here in Nicaragua. This was a good reminder to me that life is not about us on this trip, although we do get ministered to and God works in our hearts during this time, most importantly it's about the people that we are here to show our love to. Going into the first day was overwhelming and unsure to the whole team as we kicked off our first activity of the day. As we ministered to children the phrase "Trust God in Everything," many of us were being taught to just trust God ourselves. It is so hard to minister and see the circumstances these children and their families live in. They have so little, yet they are so kind and willing to give anything they have. Nicaraguenses are so loving and friendly. From the second we got off the bus, we were bombarded by the love of kids. Our bus actually got stuck in the mud and we all had to jump out and push the bus. The moment we pushed the bus out of a hole full of mud, several children rushed to greet us. One of the children was Natasha, and she wanted lots hugs and for us to immediately start playing with her. She just wanted to give us love because she knew that's what we were there to give her. 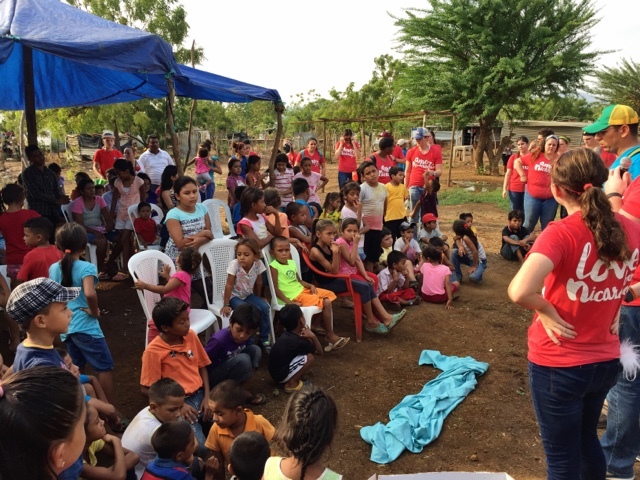 We had a wonderful time ministering at this outdoor feeding center and had an amazing time sharing with everyone the love of Christ. As we left, Natasha and several other children came up to the window of our bus to wish us a safe trip back. It was such a beautiful scene to see their glowing faces as they wanted to touch our hands one last time as we left. Even as we drove off, Natasha ran after the bus and blew us kisses. We hope that we can be half as loving as Natasha was to us in the couple of hours we were with her. * As told by Rachel Guerrieri & Joshua Santiago. We had an amazing time at a community feeding program and had lots of fun with the children. We played music, sang songs, performed funny skits and shared the story of Noah. 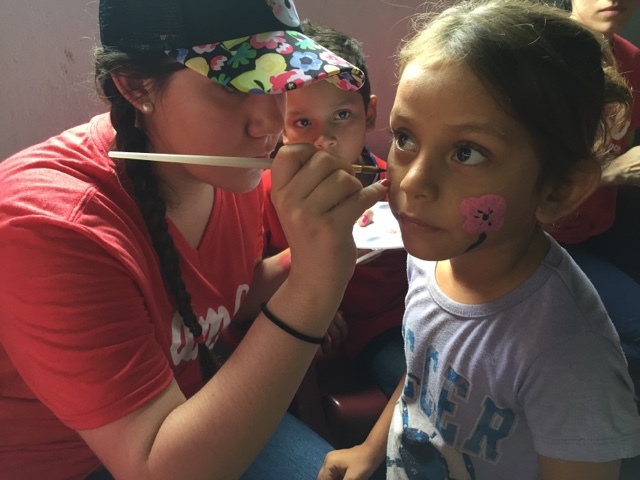 We ended the day with face painting, balloon animals and lots of candy for the children! 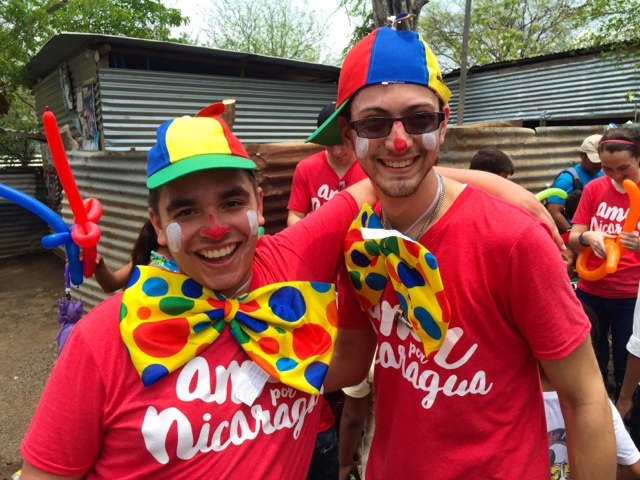 Santi and Dom acting their usual in Nicaragua! 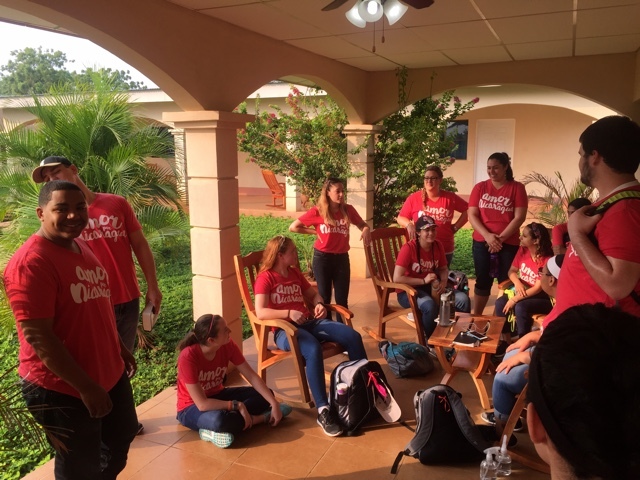 We arrived safely in Nicaragua! We opened up our first morning with devotions and prayer as we get ready for the day's activities. We are about to get on our flight to Nicaragua! We are leaving for Nicaragua on our missions trip. We will be posting every day if possible. Please keep us in your prayers. Like most other days this week, we started our day with a time of devotion. However, today we pressed in even deeper to God. We had an amazing time of prayer and worship as a team that I can truly say has made us more unified. As the first few days of our trip unfolded, I felt as if we had begun to lose sight of the true purpose we were here and were allowing our own annoyances and problems distract and ununify us. I am so thankful for the opportunity to pray as a team once again. God really moved this morning and definitely touched my heart, reminding me of my purpose here, to be a humble servant for Him. I can truly say that I am thankful for this team that God has placed together to serve and love Nicaragua. This evening we had the amazing opportunity to visit Pastor Abdias’s church. His church was like none other that we have gone to so far; the congregation felt more mature in their walk with the Lord. As soon as we got there, children we have never meet came running up to hug us. It always touches my heart to see God’s children so filled with love and joy, They were all so joyous and free and their laughter brightened the night as we chased them around and played with them all. 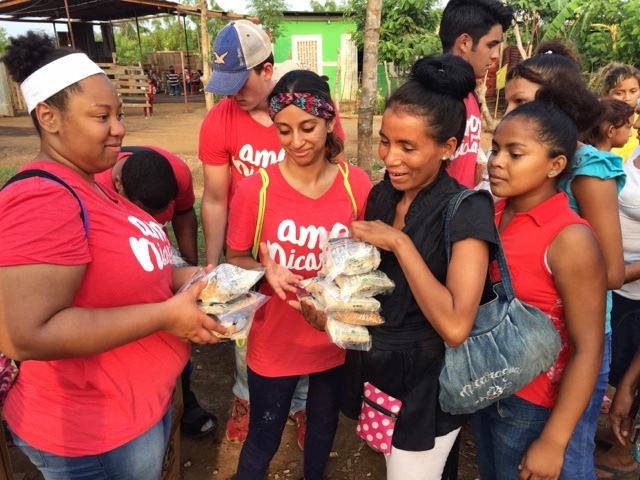 Those who attend Pastor Addias’s church, Iglesia Vida, were mostly young adults. It was amazing to see young teens on stage leading us all into an intimate time of worship. The children loved our skits, lessons and songs; they all laughed and sang along. I stayed in the main service with the young adults while one of the local ministry interns preached; his sermon reminded us all that our goal as Christians is not the gifts of God, nor is it His miracles, but our ultimate goal as sons and daughters of Christ is to seek, find and abide in the presence of Jesus Christ. After his sermon, our team came up to pray with the people of the church. It was incredible to see the hunger in these young adults for more of Christ. It was such a blessing to be able to pray with these people. These young people are the next generation to be raised up as disciples of Christ. 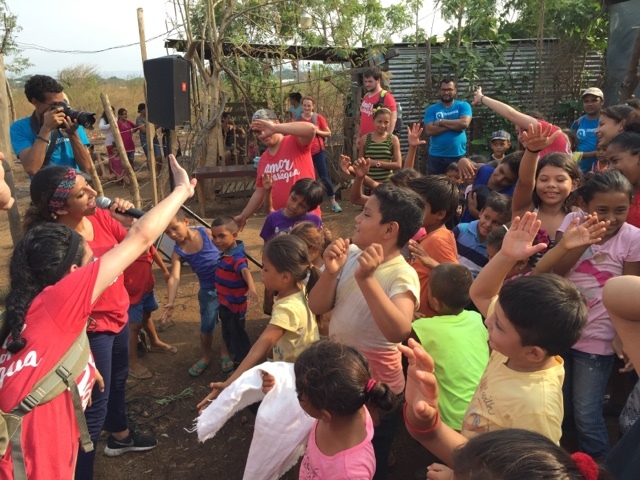 As I was praying I was filled with such hope for these kids, that they would raise up and stand up for Christ and make a difference here in Nicaragua. The biggest thing that was laid on my heart during our time of prayers with these young people was that they would never seek the approval of the world, that they would never try and fit in with the culture that surrounds them, but that they would be bold, confident and strong in Christ to be different and make a change in the lives of those around them. It is always a blessing to come up alongside the people of Nicaragua and be united as one in prayer. It doesn’t matter the distance or differences between to people, for we are all sons and daughters of Christ, unified in His name. Tuesday had a lot of ups and downs. Literally. We started the day with a program at a Children's school. 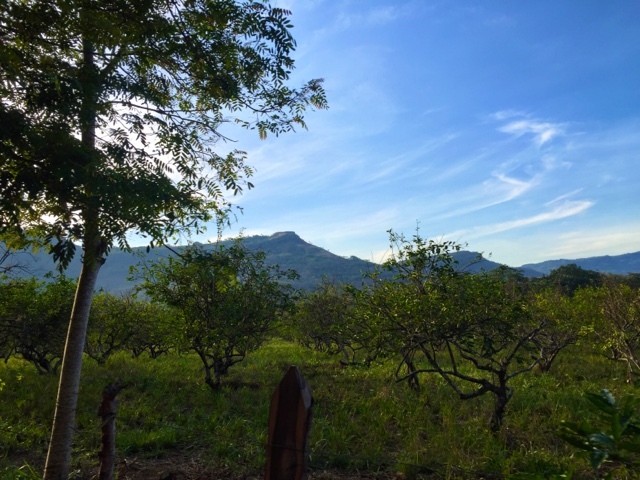 Then our team hiked through the mountains of Madagalpa, Nicaragua and visited families homes that we’re living in deep poverty. We prayed over these families and the different heartbreaking situations they were going through and and gave out food, toothbrushes, and other items, but they gave us so much more. What an eye opening experience to see the effects of poverty on an individual level. 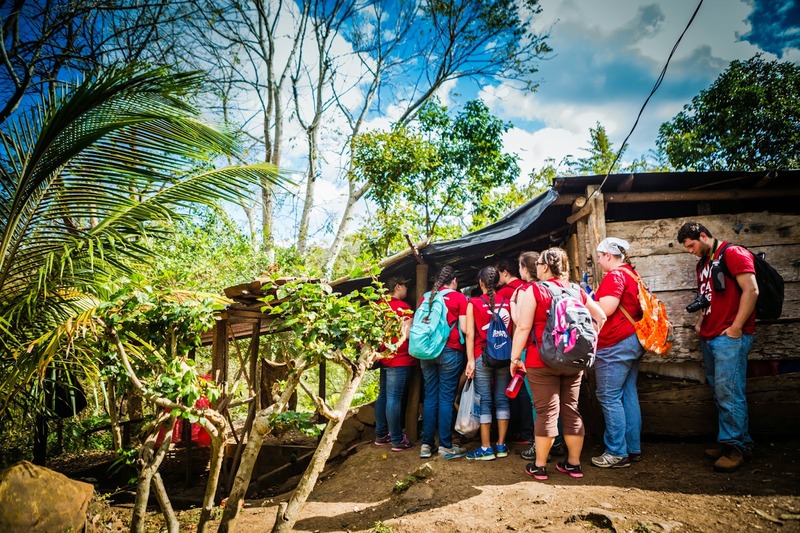 The homes we visited were made of make-shift materials and dirt floors, no electricity and oftentimes had six or seven family members living together in one room. Health problems were rampant and the lack of resources is what drew me back the most. One woman was suffering from serious infected sores on her feet and this had been an issue for many many years, but the medicine was too expensive for her to keep purchasing it and the health center near her home did not have any. The Lord has been showing me the possibilities of more I could be doing because the need truly is great. He has called me to do bigger things, and continues to reveal the possibilities to me. Walking around the orphanage, one of the boys favorite games is playing a sort of “cops and robber”. When they yell “Levante los manos” you know you have two choices; either lift up your hands and surrender, or try and fight back. Oftentimes, there is no use in fighting back, it’s better to surrender. This phrase has been extremely impactful in processing this trip and ministry. If your being chased by someone and you lift up your hands, it’s a sign of surrender, saying “I have nothing in my hands to offer”. That’s the heartbeat of God, surrender to His purpose. Nothing I do is my own, but God is working in me. Surrender. Levante los manos. Worship. 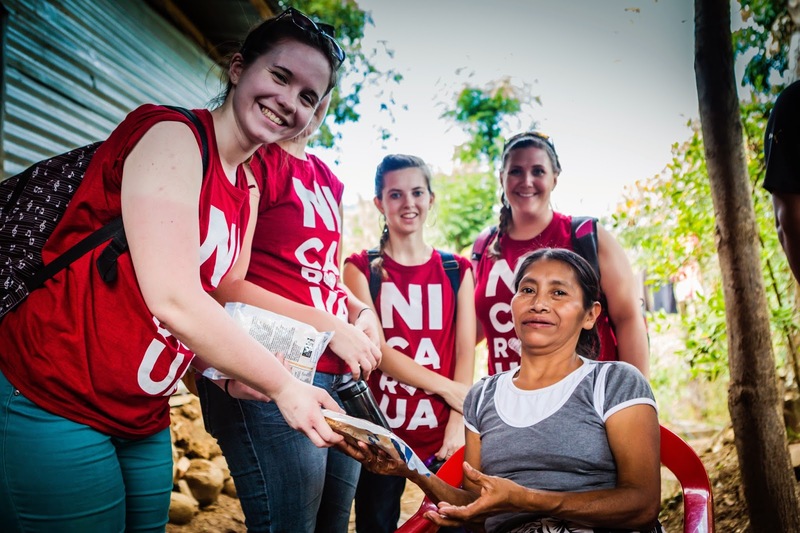 We have been involved in many church services and had opportunities to see God worshipped in many different mays while here in Nicaragua. The commitment of the people to church services and worship is incredible, it reminded me of the woman in the Bible with the alabaster jar of perfume poured on Jesus’ head. God deserves so much more than I could ever give, and there is nothing that deserves worship apart from God. So, lift your hands. Levante las manos. Giving and Serving. I’ve always thought that my giving and serving was adequate. I try to give when I can, even giving sacrificially, but my heart was shaken when I experienced the giving of some of the poorest of poorest. Both in church services as well as buying our group sodas, water or snacks. It was radical, and could only remind me of the parable of the women with the giving of the two mites (all that she had) and I could only think of myself as the rich young ruler. I had never really thought about myself that way until recently. I always just considered myself living moderately, but if the Lord asked me to sell all of my belongings and give it all to the poor… would I hesitate? I’m sure. Would I do it? I hope so, but it would be hard. God calls us to give recklessly, not moderately. He calls us to worship passionately, not ashamed. And He calls us to surrender completely, not just half-heartedly. Levante Los Manos! Our team rode for an hour and forty five minutes until we reached our destination. We entered a small cement building with red dirt in its surface, there were no tiles, or wood and carpet for the flooring like there is in the states. The room was full of elderly women and men, i was initially blessed by their diligence. I recall thinking to myself, wow…all of these elderly people are packed in this building an hour before the service started ready to receive from God. It made me stop and reflect on my own life, how there are times when I am thirty minutes early for church or five and other times i show up a few minutes late. Why do I show up late, how could I show up 5 mins before praise and worship starts? But there they were sitting in this small (hot) building with their hearts prepared to hear from God. Their commitment opened my eyes to see how easily we take for granted the opportunity we have to meet with God, how church has become a recreational activity in the U.S, where people are moved by the titles and roles they have within the church more than meeting with God, communicating with Him. Thankfully we serve a relational God, who longs for us anyway whether we serve Him or not, He loves us enough to create us in His image, sent His only Son as a sin offering for us that we would be forgiven, transformed and reconciled unto Him. One thing I will never forget from this particular service is the way the Spirit moved. There was no denying that the presence of God was there before our team arrived and as the service progressed it only grew stronger. I was moved to tears as our team made our way around the room to pray with every individual. We laid hands on them as we prayed and they touched us and interceded for us as well. As a team, I am certain there are several people in our lives such as relatives, friends, coworkers, even our pastors and members of our churches who believe we are the answers to someone’s prayers by doing missionary work in another country, and serving those who are living in poverty and struggling, but that concept is not always accurate. For an example, the men and women that we embraced there were the answers to my prayers. I longed to grow deeper in my relationship with God and being able to connect with them has stretched me for the Kingdom of God. Not even a “language barrier” could rob us from what God had in store, none of the elderly people understood english and I am not fluent in Spanish but the Spirit moved the same. I walked away enlightened, realizing that their expectations from God wasn’t based on tangible things, though we served them spiritually and physically by providing food for them, they hungered and thirsted for God and He filled them. I want that same hunger and thirst for God. I pray that we all will desire that hunger and thirst for righteousness, Jesus is enough for us. He should be our only expectation. Today we woke up really early (3:45 am) to travel to Nicaragua. Although we had to delay a day due to a winter storm passing through Pennsylvania, this did not affect the work God has for us here. We arrived to Nicaragua at about 2 pm. As we were driving to the orphanage, I was overwhelmed with compassion because of the poverty I was seeing. My heart started to break as I praised God for giving me this opportunity. 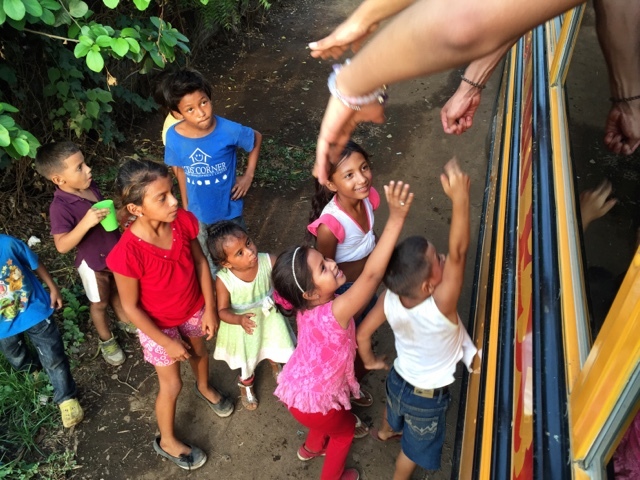 When we arrived at the orphanage, a lot of kids ran towards the bus. Right away, My team and I were able to build friendships with them. Once we were settled, we went straight to a local church. While sitting there I asked God to intercede in my prayers for these people. We were welcomed with open arms. Our team ministered through a skit, human video, and sermon. I was able to share a piece of my testimony once we were done ministering, God told me to pray for health. During an altar call, someone translated to me that people were coming up for prayer to be healed. In just one day, God has done so much. I am amazed by his love and consumed by his grace. Within a few hours, God spoke through our team and touched everyone we came in contact with. I cannot wait to start an early day tomorrow and see everything that God will continue to do. Excitement is in the air! 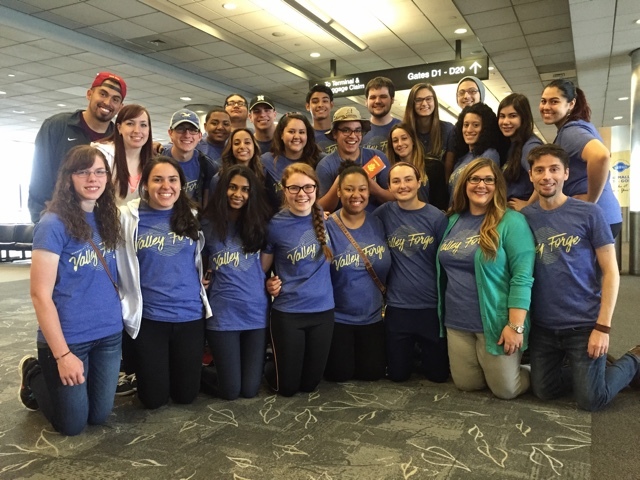 We are on our way to Nicaragua for our 2015 missions trip! Keep our team in your prayers! 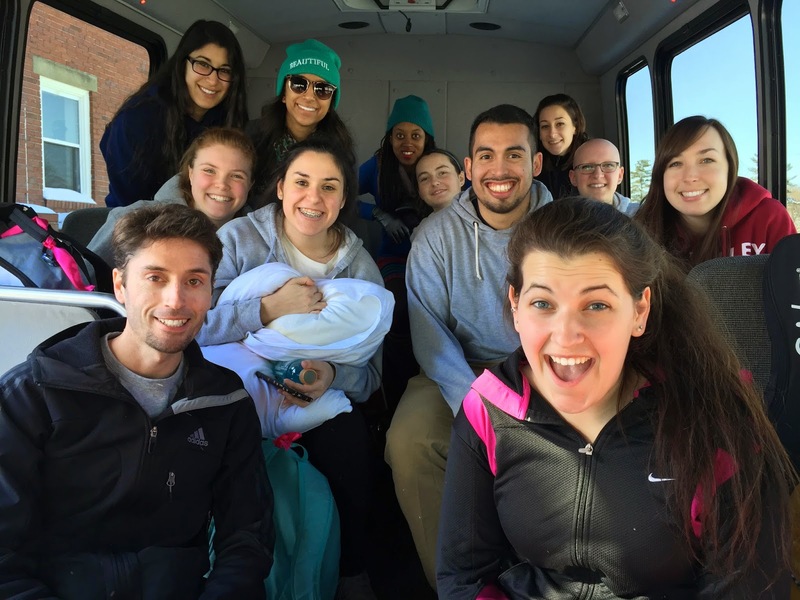 Team members from left to right: Steve Thurston, Bethanne Milton, Rebekah Rosenberg, Juan Delcid, Shaunna Delcid, Loren Metallo, Samantha Restituto, Limaris Mendoza, Kiera Lee, Kelsey Morrison, Jacqueline Brinzo and Jacqueline Day. Not pictured: Amy Thurston. Photo Gallery with 800+ Photos Coming Soon! In the next couple of weeks, we will be posting a gallery of over 800+ photos from every point of view of our activities, ministry, services, children's programs and time at the orphanage. 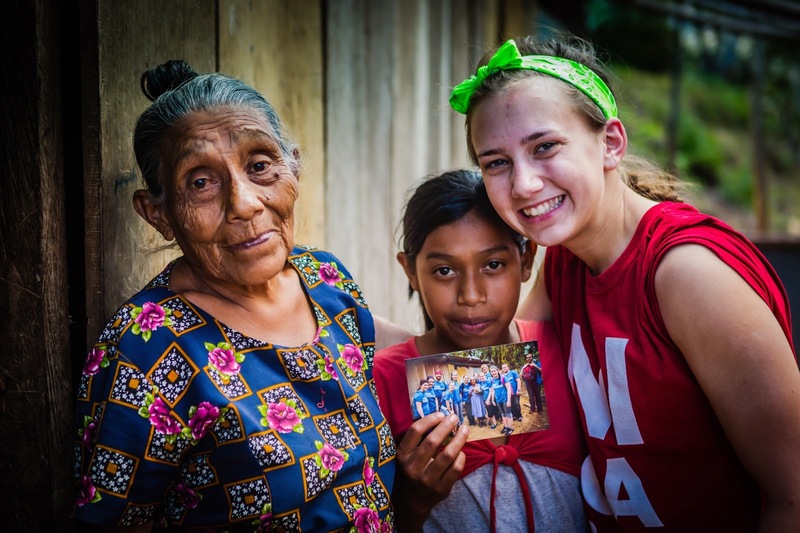 Come back soon to view the visual sights and sounds of our Missions Trip to Nicaragua 2014. Today we hiked up a mountain, stopping along the way at each home that we wanted to distribute food to. Each home was not what I would consider a home but more like mud and wood together to make a little hut shelter. At each home we went to, we met the families and were able to pray with them and bring them food. Although the scenery around on the mountain was beautiful, the sight of these people and the conditions that they lived in was heart breaking to say the least. With each step up the mountain, climbing in the heat, was a reminder of the people’s hard life of daily making that journey while hungry, weak, or in bad health. A few houses we stopped at I will never forget. One, as I approached, had dirt floors, holes all through out the shelter and it looked more like a pile of burning wood than a home. It smelled of burning trash and there were starving, rib thin dogs wondering around aimlessly. We stopped and asked what we could pray for and a small woman sat down and took off these small pieces of fabric covering her ankles. These pieces of fabric acted as bandages. Her feet were swollen and covered in ulcers. Her husband has been very sick for a long time and almost died. Such pain I saw in their eyes. As we prayed for them, tears flowed. How do they survive? How do they get water or food or get up and down the mountain? Then, as we continued up the mountain, we stopped at another shack with a similar beaten down shelter. There stood a small woman with a little boy who through her weeping, asked for us to pray for her daughter who was taken by an abusive boyfriend and is not allowed to come home. Such broken hearts stood before me. We prayed and encouraged them, letting them know that God sees their daughter and we prayed for her protection. Another shelter we arrived at didn’t even have four walls. Part of the roof was made up of garbage bags and inside there was a few pieces of wood planks in which served as a bed for a family of three. As I looked around my heart sank. The belongings in the home could have easily been counted on one hand. They literally had nothing. I got emotional and had to walk away from the group and get myself together. It wrecked me, I had never seen anything like that in my life. How could people live like this? How do they survive? I started thinking if bad weather came, there would be little to no real protection or shelter. I’ve never seen such poverty. My heart sank and tears flowed as I realized how blessed and lucky I am and how much I take for granted. Another home that we stopped at that impacted me the most. It was a shelter with a small old lady and a little girl who was abandoned by her mother. The old lady was her grandmother and she took the little girl in. I got emotional as I listen to them tell us how her mother doesn’t want her or care for her and I felt that, in a sense, I could relate in feeling that way towards my own mother. Throughout this whole day, God broke my heart for His people and taught me how to love through prayer. Getting to hear from each family and praying with them created in me a true love for the people of Nicaragua. This process taught me that no matter what the language barrier, or horrible situation, God loves all his people and through it all, He is on the throne in every circumstance. Above all physical needs, the greatest need of all is the love of Jesus Christ.